On Saturday morning we were up bright and early to visit one of our favourite local attractions - SEA LIFE Manchester, in Barton Square at the intu Trafford Centre. We'd been invited along to see some of their newest inhabitants in their brand new installation, the Octopus Hideout. 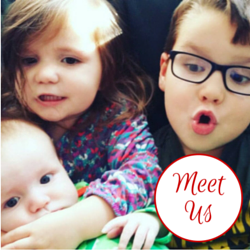 As ambassadors over the past year we've visited SEA LIFE Manchester regularly, both Bud and LM have their favourite creatures to visit - Bud loves seeing Ernie the Green Sea Turtle whereas LM always wants to get hands on with the crabs and starfish in the rockpool. My favourites are the seahorses and the huge, circular Ray tank where the beautiful fish race around and seem to compete for attention! A big part of each visit to SEA LIFE Manchester is seeing what is new each time, and taking part in the different activities available. Bud and LM have to get all of their stamps in their SEA LIFE passport, and there is usually a craft or similar interactive activity to participate in too. Saturday's visit gave us the opportunity to see the brand new Octopus hideout. 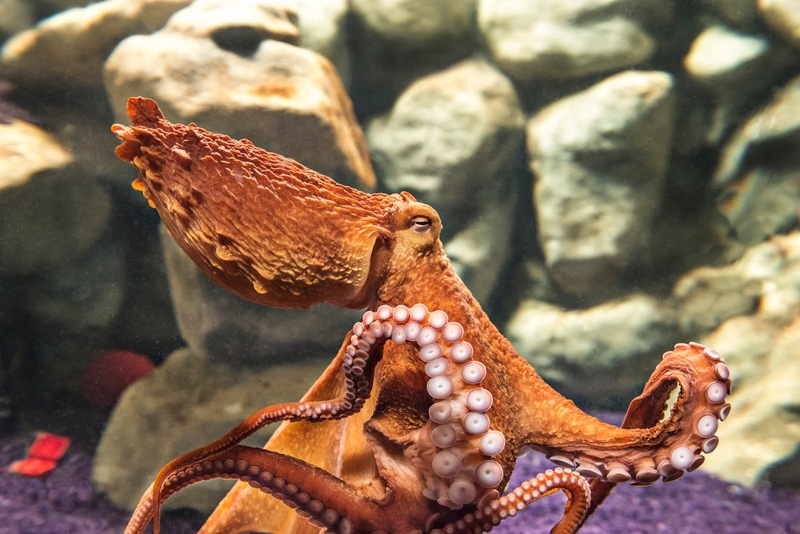 We love playing 'hunt the octopus' and trying to spot the centre's Common Octopus (we've only seen her once in all of our many visits) and we were really keen to see the Octopi that have been added to the centre's newest attraction. You can meet Hank, the Giant Pacific Octopus, one of the smartest creatures from the ocean, see the tiny Atlantic Long Arm Octopus whose arms are longer than its body and don’t miss the incredible Nautilus, an octopus in a shell that has barely changed in 500 million years! 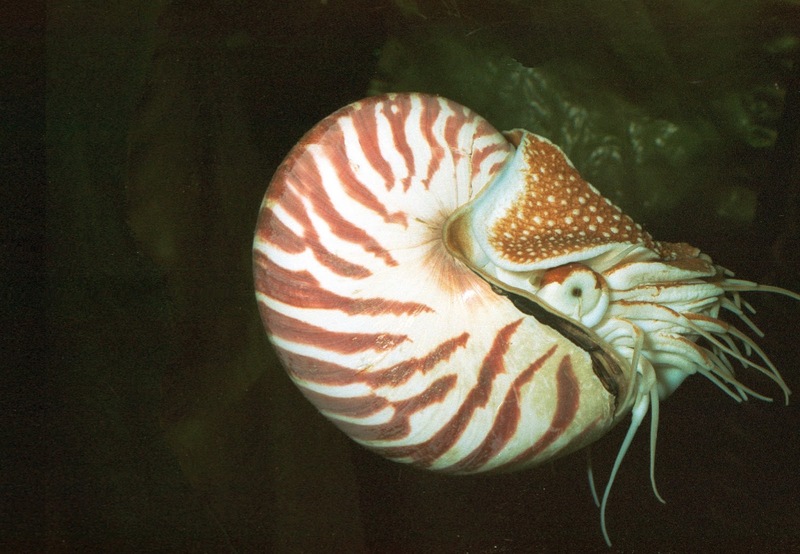 I think the Nautilus are my new favourite sea creature, these prehistoric animals look rather like aliens and it's fascinating to watch them bob around in their tank. The Nautilus are a good fit for the rest of the half-term fun at SEA LIFE Manchester which is themed around Ancient Oceans. This is a week-long event packed full of activities, workshops and talks designed to teach visitors about the fascinating history of the oceans. The charismatic Dr Dug will be on hand to oversee archaeological digs and visitors will get the opportunity to learn about the evolution of the mesmerising sea creatures, some of which have been around for over 400 million years, such as sharks, jellyfish and turtles, making them older than trees! 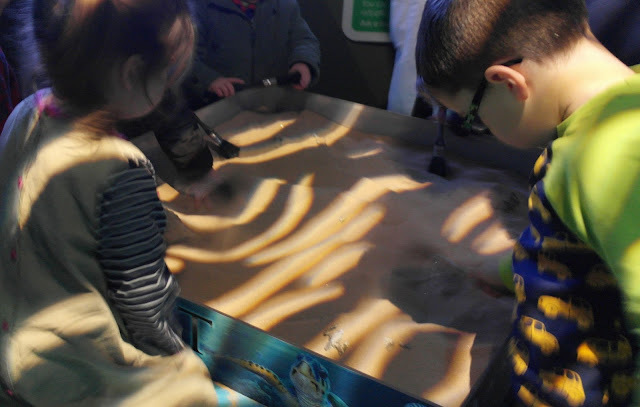 Bud and LM loved uncovering the fossils in the sand pit and Bud was happy to fill the SEA LIFE staff overseeing this activity in on the dinosaurs and marine reptiles he is familiar with from his massive interest in prehistoric creatures. The children were rewarded with their very own sharks tooth, and the must have collectable SEA LIFE badges for the Ancient Oceans event. Both are now taking pride of place in Bud's bedroom. In addition to seeing the old favourites of the turtles and sharks, our children all love tearing around in the soft play area before visiting the creatures that they can get up close to in the rock pools. No visit is complete without stroking a crab or starfish. 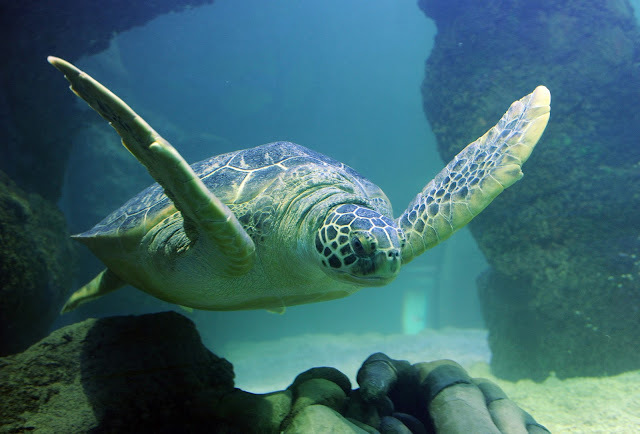 We love SEA LIFE Manchester and would really recommend it to families looking for a fun half term excursion. 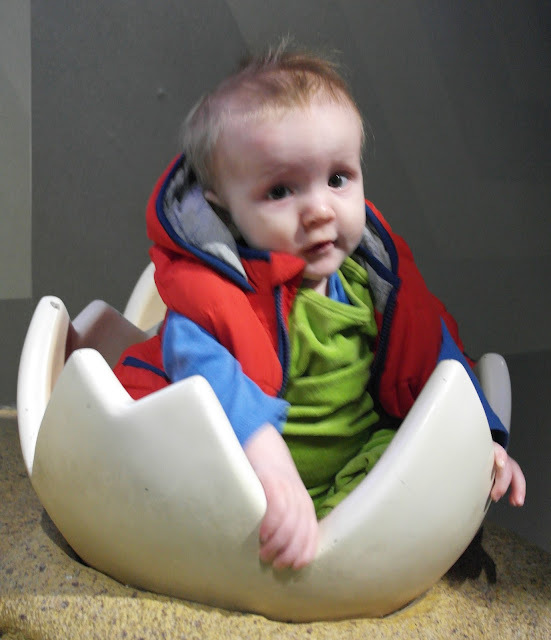 Even Little E enjoys our visits more and more each time and is rather mesmerised by the fish swimming in their tanks. If you're thinking of visiting SEA LIFE Manchester this half-term then consider combining your visit with the LEGOLAND Discovery Centre just next door. In addition to their rides, MINILAND and ways to build with LEGO they have a brand new The LEGO Movie 4D film arriving in March. We're so excited to see the new adventures of Emmet, Wildstyle and Risky Business when they arrive on the big LDC screen on the weekend of March 11th. For information and to book tickets visit SEA LIFE Manchester or LEGOLAND Discovery Centre, you can save money by buying in advance or purchasing a combi ticket which allows you admission in to both attractions. We attended the event as guests of SEA LIFE Manchester.